The international Red Cross is pressing U.S. authorities to release three letters written by toppled Iraqi leader Saddam Hussein to his family, saying the usual censorship process has been inexplicably delayed. Nada Doumani, a spokeswoman for the International Committee of the Red Cross delegation to Iraq, told The Associated Press Tuesday the letters had been handed over to U.S. authorities for checking, as the Geneva Conventions provide. She said that "there has been a lot of delay" in releasing the letters, but did not have the dates they were written. "We have repeatedly raised the issue with the detaining authority and urged it to speed up the process," Doumani said. One of Saddam's daughters, Raghad Saddam Hussein, told an Arab women's magazine earlier this month that the Red Cross had delivered one letter from her father, who has been held by U.S. forces since his Dec. 13 capture. She said three lines of the six-line letter were deleted by censors. Section V, article 71 of the Geneva Convention on prisoners of war says, "Prisoners of war shall be allowed to send and receive letters and cards." "Such letters and cards must be conveyed by the most rapid method at the disposal of the Detaining Power; they may not be delayed or retained for disciplinary reasons," the convention reads. Doumani's comments on the letters came a day after a group of Jordanian lawyers claiming to represent Saddam met with the ICRC delegation to investigate allegations that the Iraqi dictator had suffered "light injuries" while in detention. "There was no ICRC report to that effect," Doumani said. She said the lawyers could be referring to an ICRC "capture card" dated Jan. 21, a month before ICRC delegates met Saddam in detention. The card is usually distributed to authorities worldwide, who in turn give it to detainees to fill it out. "I believe the lawyers are referring to this card which referred to 'slight injuries,'" Doumani said. "It could have been Saddam Hussein or somebody else who filled it out, but we don't have information if the injuries were on Jan. 21 or dated back to his arrest" in December. Ziad Khassawneh, among lawyers who say they were appointed for Saddam by his wife Sajida, said the ICRC assured him and the other lawyers Monday that Saddam was in "good health." But he accused the ICRC of failing "to play its role as a protector of civilians under occupation and one proof of that was the abuses in Abu Ghraib prison." He said the ICRC has also failed to help the Jordanian lawyers meet with Saddam. Doumani said ICRC was the only organization allowed to visit detainees and that Red Cross procedures adopted since 1915 have proven their "efficiency" and that they were geared toward the "protection of detainees." Last year alone, ICRC visited 470,000 detainees worldwide, she added. The United States will transfer legal custody of Saddam and other top prisoners to Iraqi authorities as soon as Iraqi courts issue the necessary warrants, a U.S. official said Tuesday. U.S. forces will honor transfer-of-custody requests from Iraq's incoming government, which takes power June 30, as long as they are accompanied by arrest warrants from an Iraqi court, the official said in a legal briefing with reporters. Details of the transfer will be laid out in a memorandum of understanding between U.S.-led multinational forces and the incoming Iraqi government, he said. But U.S. forces won't let go of the former dictator, even after Iraq regains its sovereignty next week, because it doesn't have a prison strong enough to hold him, the official said Tuesday, speaking on condition of anonymity. American forces need to keep Saddam and other top figures from his regime in coalition lockups for their own safety — and to secure them against escape or other mishaps, the official said. 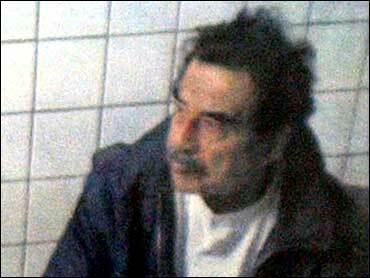 Saddam, who is said to be incarcerated at a U.S. prison near Baghdad International Airport, will be in the first group of prisoners turned over, he said. Once his legal custody shifts, Saddam will lose his prisoner of war status and will be considered an accused criminal. As such, he will win due process rights, including access to an attorney. He also will be subject to questioning by an investigating judge from the special Iraqi war crimes tribunal set up to try him and others for crimes against humanity committed during his brutal reign, the official said. Judges have refused to work for the tribunal after five potential candidates were killed since Saddam was toppled from power last year. It is unclear what crimes Saddam will be charged with committing. The Iraqi tribunal is empowered to prosecute war crimes, genocide, crimes against humanity and violations of specified Iraqi laws.